Where does the Rajacenna-multiplier come from? Out of nowhere and even without her own knowledge and approval, Rajacenna (my daughter) has multiplied herself on Facebook. Apparently suddenly there are walking 22 pieces of Rajacenna around the globe today and I’m not sure they can all draw like Rajacenna does. Well I’m sure: they can NOT. Trying to be very modest here. Now most of you will think “what’s the big deal, there are more puppys named Bob…. or Rajacenna”. Well not quite; I doubt that before 2009, when Rajacenna got well known, these 21 pair of parents decided all to name their new born ‘Rajacenna’. Nobody in the entire world knew about this particular name. I invented Rajacenna’s name myself in 1993 (it is a mix from 3 names) and at the time IT DID NOT EXIST! No such name as ‘Rajacenna’. Nowhere on the entire globe. I had to get this name officially verified! But enough about her name: I really have to know how one can multiply his self and I’m not finding any YouTube tutorials or quick tips and all across the internet. And I need to know because 1 Celesta is just not enough to multitask and to win 21 times the lottery and to become multi millionaire 21 times to first make myself healthy again because now keeping up with it chronically slurps big bucks and then to buy a ton of real toys for newer generations so they can be kids again as it was meant to be instead of endup being guru at the age of 5, making fake profiles with daughters name and become millionaire, because that’s not funny. At all. 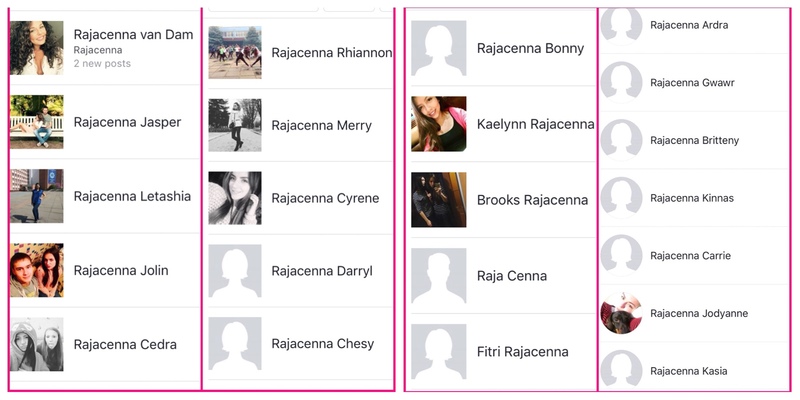 I asked Facebook to remove this explosion of Fake Rajacenna’s, but I don’t think they care very much. Facebook is always more concerned about their own (US) nationality facebookers than foreign countries and their citizen people who also do exist you know, no matter what Facebook makes you think.